I’d like to thank any and all of you who participated in the first part of the hacklibschool experiment. If you missed it, or are just catching up now, this is the original post I wrote that kicked off the project. The impetus behind hacklibschool is simply to get LIS students talking, sharing and helping one another navigate the transition to the profession by sharing one collaborative space. It started as a Google Doc, migrated to a wiki and is now moving into a co-blog space. I’d like to see this develop into a space where LIS students will contribute a post here and there based on their experiences in library school. I would love for this co-blog to get finely tuned and become a edited, publishing machine like Profhacker, but lets start small ok? I welcome thoughts, ideas and comments, and would like to take this chance to invite those of you who would like to serve as editors, or regular contributors to this space (maybe 4 editors/writers to begin?). Criteria are broad at this point (newly graduated lib schoolers still count), and it’d be great if we had some sort of editorial calendar to get content flowing. I also want to emphasize that I highly encourage crossposting between this space and your personal blog. Lets spread good, useful info far and wide. 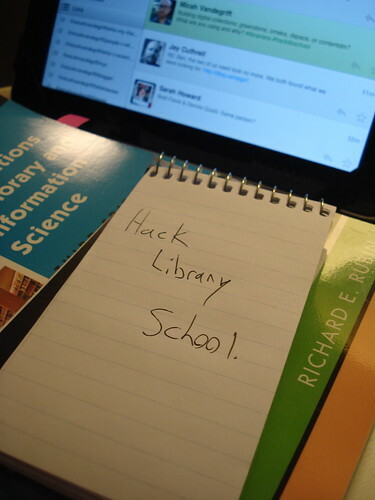 Welcome to hacklibschool – the co-blog edition. Testing the comments to see if they show up in the side bar. Sweet! This looks awesome and the content is fantastic! I like this co-blog format much better than the wiki. I applaud that you are providing not only a forum, but also extremely relevant information for MLIS students. Thank you!